Scientists are warning CO2 is being emitted into the atmosphere today at a comparable rate to the amount released millions of years ago which caused the biggest extinction event in the history of the planet. Around 90% of marine life is thought to have been wiped out in an extinctionevent known as “the great dying”, which was the bridge between the Permian and the Triassic periods 252 million years ago. The cause of the event has been a matter of debate in the scientific community. But a team of researchers coordinated by the University of Edinburgh say they now have evidence that volcanic activity releasing huge amounts of carbon into the atmosphere caused the acidification of the oceans, wiping out the majority of life on earth. The Permian extinction wiped out 70% of terrestrial vertebrates, and was the only known mass extinction of insects. How does that relate to ocean pH? Note that CO2 levels then remained high throughout the Mesozoic, as life flourished and Dinosaurs ruled the planet. Acidic scientist brains, not acidic oceans. is this not old news ? Thanks for this reminder of MIT’s long record of deceiving the public. The author of the nuclear physics textbook, The Atomic Nucleus by MIT Professor Robley Evans, promoted the seriously flawed concept of nuclear stability by Dr. Carl van Weizsacker’s “nuclear binding energy” in the 1950s. Does anyone know the current ranking of academic institutions by amounts of federal research funds received? THE COST OF DECEPTIVE SCIENCE? Billions of dollars are collected from innocent citizens of numerous countries worldwide to support misrepresentation of the beautiful, bountiful and benevolent universe described in the abstract of this paper – “Teacher’s Supplement to Solar Energy” . . .
with pseudo-scientific nonsense from thousands of physicists employed at the Large Hadron Collider in CERN. The cost in terms of human misery and depression far exceeds the monetary cost. My goodness, I don’t want to be mean or unkind, but you are like an old warped record that keeps repeating the same thing. My son has been at MIT for 15 years, as a student and as a project scientist. This is one of the top technological institutes in the world and is especially notable because of their insistence on applied science. In other words, their science is tested and demanded to be applicable to the real world in that it actually works. He is in an area where theory means nothing unless it can be actually demonstrated in results. Your defamation of this great institution is very offensive to me, as I have seen firsthand what he has to go through just to survive. Jennifer Chu is obviously no scientist at MIT. She’s probably a journalist. All scientists have known for decades that the extinction was caused by volcanic ash and sulfur compounds from the Siberian Traps event. The sulfur and ash are found in the sedimentary layers. There has never been any doubt about this. Now all of a sudden it was the CO2 and the return to previous CO2 levels? How does CO2 kill anything? Plants love it. The air in your lungs is 30,000 ppm CO2. Massive global warming kills 96% of life on earth? Three doublings of the current CO2 level will cause a 6 degree rise in temperatures. There is a 100 degree change between equator and poles and an equal change from winter to summer. So she says it’s the “rate of change” of the CO2 that kills everything. Who cares about the rate of change? What is the rate of change of CO2 when the greenhouse keeper blows CO2 into a greenhouse every morning to raise the daytime level to 2000 ppm for the plants? The best academic institutions receive the most federal research funds and promote the biggest government lies. Harvard, Stanford, MIT, CalTech generate the consensus science garbage that is taught as factual information in state universities, state colleges, junior colleges, etc. That error does not becomes serious until nuclear structure inverts at ~150 amu. For all atoms, planets, stars and galaxies heavier than ~150 amu, neutron repulsion becomes the dominant source of energy in their neutron-rich cores. What killed everything was most likely sulfur dioxide from the Siberian Steppes event. Not CO2 which the huge forests of plants love so much. Just made the same comment over at CE. Serbian Traps was obviously a basaltic eruption, probably hot spot related like Hawaii today. CO2 releases from subduction zone eruptions, coming from recycled carbonate rocks. The paper highlighted acidification from the Serbian Traps event. But it was from SO2 acid rain, not CO2. Explains much of the delusion. But aren’t we in danger of bringing the dinosaurs back? Didn’t you see that movie? Michael Crichton was one of our best skeptics. Gator, it would take someone far from the hollywood mainstream to produce that movie. When the gates of AGW and CAGW have quite crumbled, I suspect there will be those eagerly ready to do it. I only hope you and I are alive then. Agreed! Michael Craighton recognized Big Brother’s lies before Steven Goddard, but he did not survive to see the end of Big Brother’s 70-year reign of rule by deceit. State of Fear dramatizes the human and societal costs a democracy faces when it embarks on a war against terror, a war potentially without end, all too easily exploited by unscrupulous leaders seeking personal political gain. Find a producer and crowd source? WTF? Methinks you’re just not getting it. Wiping out the Passenger Pigeon was dumb fugging shithead sport. Gun and grog, no respect. 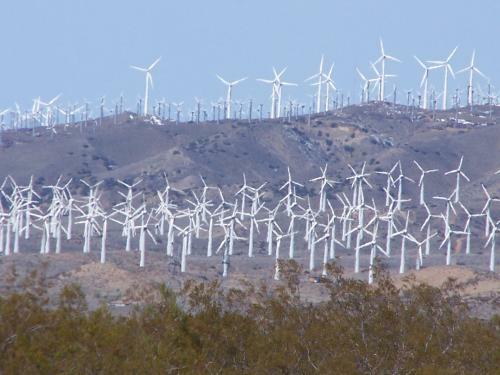 My point was to point out the bird killing power of the wind turbines, not to condone in any way the slaughter of the passenger pigeons. It’s satirical. My bad. Realized that further down the thread. Cheers. What’s the issue? Is the code wrong? Do I need to specifiy a width? Does the image file have to be http and not https, or something? Again, I’ve tried googling, but most of the posts seem geared toward bloggers not commenters. 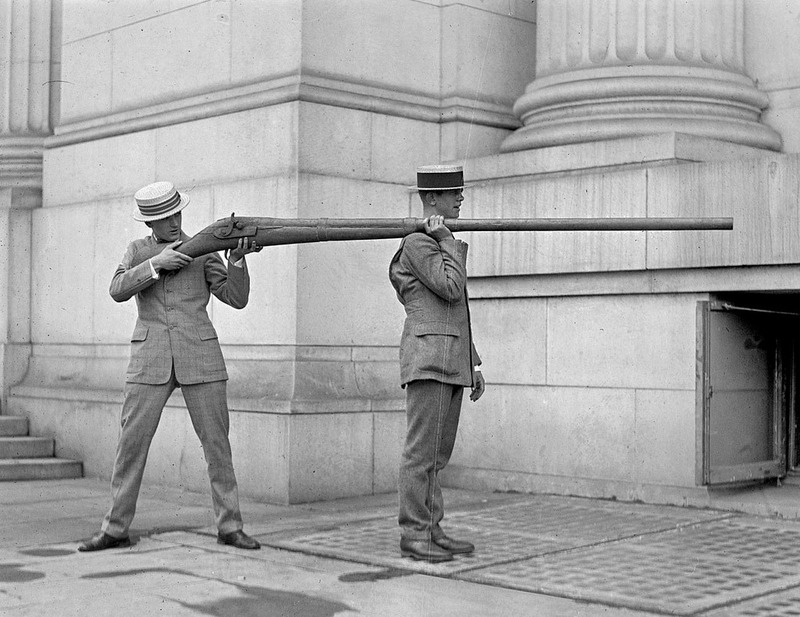 Punt guns were usually custom-designed and so varied widely, but could have bore diameters exceeding 2 inches (51 mm) and fire over a pound (≈ 0.45 kg) of shot at a time. A single shot could kill over 50 waterfowl resting on the water’s surface. They were too big to hold and the recoil so large that they were mounted directly on the punts used for hunting, hence their name. Hunters would maneuver their punts quietly into line and range of the flock using poles or oars to avoid startling them. Generally the gun was fixed to the punt; thus the hunter would maneuver the entire boat in order to aim the gun. The guns were sufficiently powerful, and the punts themselves sufficiently small, that firing the gun often propelled the punt backwards several inches or more. To improve efficiency, hunters could work in fleets of up to around ten punts. In the United States, this practice depleted stocks of wild waterfowl and by the 1860s most states had banned the practice. The Lacey Act of 1900 banned the transport of wild game across state lines, and the practice of market hunting was outlawed by a series of federal laws in 1918. My dad was a hunter too, and he lamented the use of these WMD’s on wildlife, and the loss of the Passenger Pigeon. A national disgrace. Not the gun, those are highly collectible, and only kill what we point them at. Lol on those punters! Great varmint hunters too! Better to error on the side of overkill than to let the pesky rodents and what not escape. Would have been Romney’s varmint hunting favorite. Insane shells. I don’t think you shoot one of those on someone’s shoulder like in the photo though, at least not my shoulder. After posting a photo of a murder of crows on my FB page, someone asked me what a group of dinosaurs is called. I suggested we name such a group a “crichton”. How can I nominate this as an official designation? That was 65 mya. This was 252 mya. I will be watching them pump out massive amounts of carbon tonight at Lincoln Park speedway. The Indiana Sprint car season kicks off and their offering a $4,000 purse for the 30 lap feature. 900 hp with a power to weight ration similar to F1 but it’s all on dirt. Here is what a qualifying run looks and sounds like from inside the car. Back in my drag racing days, I used to love to watch the dirt trackers at the local fairgrounds on Saturday nights. That is real racing, just the way bootleggers invented it. I like Lincoln Park. Good track and one brings their own lawn chair and sets it up on the concrete stands. Not a bad seat in the house as long as you don’t get too low down the stands next to the track and there isn’t a strong breeze blowing in your face. Always wear my old Jungle Army jungle hat. I’ll be going to watch the sprints on the dirt tracks at least every other weekend over the summer this weekend. And as you say, it is the purest form of auto racing out there. Guys having about as much fun as a person can with their cloths on spending a small fortune to do what they Love. You wanna know how to make a small fortune racing? Start with a large one. It’s been many, many years, but a friend and I used to go to watch Sprints and Midgets at Salem Speedway. Those boys have nerves of steel. Thanks for the memories. We also went to the Indy 500 one year. That was the year Danny Sullivan’s car spun 360 degrees, and still he went on to win the bottle of milk. Utterly amazing. I grew up only 30 mi from the brick yard. Gone to about 10 Indy 500s and dozens of qualifying days. Watched Andy Granatelli’s STP turbine powered car. Sachs and McDonnald died right in front of me at the very first one I went to when I was almost 9 years old. Watched Al and Bobby Unser win. Watched Mario Andretti win. And then years later watched Little Al beat out Micheal Andretti at a race where it was so cold you could see your breath. Been to two Brickyard 400s also. But somehow about 10 years ago I lost my desire to go. Stopped watching auto racing on TV long ago. Open wheel on dirt is just more real to me. Before the race you can go walk down in the pits and look at the cars and talk to the drivers. It’s all less controlled and contrived than than NASCAR or Indy Car or Formula 1. A much more up close and personal type of thing. A whole lot more slicing and dicing on the dirt and the ever changing track surface keeps things interesting. The spectator can see the whole track and what is going on. Open wheel on dirt is just more real to me. Before the race you can go walk down in the pits and look at the cars and talk to the drivers. That was one of my favorite things about the dirt track as well. Back then I had built two hot rods, that I would take to car shows during the day, and then drag race on main street at night. Going into the pits and watching the drivers tune their cars by ear, no computers, and no sponsors other than the local tire shops. The motors were no different than what I had under the hood of my car in the parking lot, and occasionally I was asked to turn a wrench or crank the motor as the driver looked for trouble. It wasn’t just a spectator sport, and I get bored watching other people do, while I sit. To this day, I cannot stand watching sporting events including professional racing, with the exception of the occasional drag race. Now days, though they still aren’t hooking computers up to them, the engines cost about $30,000 each. It is still turning wrenches, tuning for performance, selecting rear ends, figuring out the best tires and suspension set up for a given track and the conditions. We helped one team before also when they were short handed and under the gun on time. Have met several drivers that built their own cars. The highlight of the season around here is Indiana Sprint Week which this year is from July 10 to 18. Seven big money USAC races in nine days. Each race at a different track in the state. Drivers from all over the US come to compete and people from all over the country come. Many of them go from one race to the next in their motor homes. I agree, the sprints and midgets were much more real, and enjoyable to watch. It was experiential. The high stands at Salem allowed us to see the entire race. The high banks, lopsided tires and short track, the noise, the closeness, the danger, the ability to walk around, all of it juxtaposed in the rural setting, made for a truly enjoyable day at the races. If I never go again, those are fond memories. We had just been to Salem Speedway recently, before Rich Vogler was killed there That’s the worst part of racing. But he died doing what he loved. I understood that Gator. Just figured that if you hadn’t been to one for awhile you would like to know it isn’t much different than it was. Cars are much safer and faster, but that’s about it. Great video – thanks for making my life better this evening! No gears, no clutch, no shifting, brakes optional. The way the Good Lord meant for driving to be. Up until now, they always knew that it was the volcanic ash or sulfer that did all the killing, nobody ever remotely accused CO2 of it, until the idiots got control of science. Now that morons are in charge of the science grant money, science is no better than science fiction. In fact, to a science ignoramus, there is no difference between the two. Not to insult anyone who has knowledge much greater than me, I am injecting a little lesson for anyone who may not remember some basic chemistry. However, the means of measuring ocean pH lately is complicated and suspect, depending on where and how it is measured. Estuary’s often have a pH of about 5 to 6 because rain water is acidic. As stated above volcanic emissions are heavily sulfur oxides (the emissions are sometimes referred to as aerosols) The sulfur oxides are strong acid anhydrides or producers of moderate to very strong acids (sulfuric) when combined with water. The aerosols will actually cool the earth. One of the current claims (excuses) for the 18 year lack of warming is emissions from small volcanoes. CO2 when combined with water produces carbonic acid, a weak acid. you know like pepsi and mountain dew. darrylb has an excellent explanation. But I would put it a different way. Logarithmic, in this case, is the power of 10. Exponential would be any base, not limited to 10. And pH is limited to a range of 0 – 14, due to the self ionization of water it cannot increase indefinitely. Actually are conflating two things within the same concept. Water is considered the universal solvent and so we are talking about water solutions, even in the atmosphere. I wish I had the ability to make superscripts and subscripts on my computer, but I don’t, so exponents will be on the same line. And to be correct to the science If I say the concentration is 1.0 times 10-7 then the pH should be 7.0 not 7 ya know, significant figures. Usually, the acid in an acidic solution, especially at low pH is H3O+ that’s not always the case however. In sea water, the acid is bicarbonate. H3O+ is at very low concentration at higher pH and contributes very little to acidity. Cockroaches and insects have been around longer than the dinosaurs. Through all forms of climate. And they are still here and doing well. These “so-called” experts are just pounding smoke to get more of our tax money. Create a scare and then act the hero to claim they have saved us from a fate worse than death, that is the way these people work. Totally despicable. Cockroaches will survive WWIII, too. Wow, first time a climate model has proved anything !! roflmao !!! Limestone rocks would have to be alkaline, the opposite of acidic. I will have to find and read the Newsweek article. What? they found the limestone to be less alkaline because of reactions with acidic substances? If real journalism existed, the reporters would ask Warmist leaders how they rationalize their claim that humans are overpopulated and must die — while alternating their warnings that our CO2 emissions will kill other life on Earth too. Do they want us to depopulate, or want us to survive and multiply more?? They can’t have it both ways, except in the minds of electioneering globalist power trippers. Insects first appeared in the Devonian at least, probably the Silurian. They evolved when CO2 levels were 10 times what they are now. The level that we are not likely to come close to reaching if we burnt all the known reserves of coal. The uncertainty of CO2 levels hides a probably more likely cause. The carboniferous period saw a huge drop in CO2 levels as plants absorbed it and turned it into peat (to later become coal). CO2 levels dropped and equilibrium would have reached a point where it was so low that plants could not survive until the population of herbivores and microorganisms increased to keep plants in check and a new equilibrium was reached. What would have happened if the Siberian Traps were just a small example of world wide basalt eruptions and increased pH of the oceans? Could it have dropped the atmospheric CO2 levels to well below 200ppm? A small drop in vegetation while there was a large population of herbivores keeping plants in check could have decimated plants (and algae) eventually leading to a crash in animal populations. Robert, a drop in CO2 to 200 ppm causes a drop in vegetation that would cause herbivores to keep plants in check? Makes no sense. How about, a drop in CO2 keeps plants in check and herbivores all die? No. 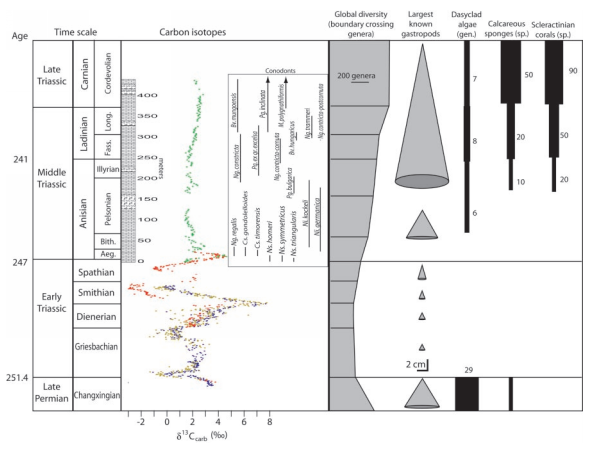 The herbivore (and other organism that break down plant matter) population might not have been large enough or evolved enough to keep plant growth down (hence the huge amounts of coal from this period) and it was kept in check by the low levels of CO2 at the end of the carboniferous. A sudden drop of 100ppm should not do much to plant growth now when its kept in check by animals but if it was nearer to the lower limit, it would. Plant growth is kept in check by what herbivores? The trees around here are 100 feet tall. What are you talking about? 100 foot herbivores? “Other organisms that break down plant matter,” by which I assume you mean plant decay, are not herbivores, and you can’t check plant growth by eating dead plants. Plants can’t grow when the CO2 goes much below 200 ppm. Plants die and the herbivores were already dead, as were the carnivores and humans. Life on earth cannot exist if the CO2 goes much below 200. If it weren’t for the Siberian Traps event, 252 mya, the only life on earth today would be tube worms. You’re just being difficult. Something limits the spread of plants. Herbivores or organisms that are parasitic as well as breakdown the dead matter. You might want to look up “koala”. They need to be culled to stop deforestation. And I’m drawing a long bow? For anyone still reading with some intelligence. The postulate is that the spread of plant growth is limited by a suitable climate, things that kill or severely limit growth such as herbivores and parasites, and low CO2 levels. If the first two are minor, then the CO2 levels will reach an equilibrium close to lowest at which the plants at the time could survive. About 210ppm before the KT boundary. Now if it dropped merely 20ppm, it would be 190ppm then there would be massive die off of plants (and algae?). If the population of plants is limited by the first two, then the CO2 levels would be higher such as 290ppm. You would then need an event that would drop the the levels 100ppm to have a catastrophe. Maybe not correct but simple to follow. The Dragon Fly is one of the most awesome creatures on earth. I am certainly glad to be on the top of the food chain and not one of their prey. And the states they go through during their metamorphosis is just amazing, from living in the water to moving to land before becoming their final magnificent being. I love watching them fly and zap mosquitoes and other flying insects from the air. Glad they don’t have their sites set on me. In the evenings in Summer, I get swarms of dragonflies, martins, and swallows, all competing for mayflies and other juicy prey that hover no higher than about 8 feet over my lawn. It is an amazing sight, because the predators are all making repetitive patterns back and forth across the same area for an hour or two before dusk, and they somehow manage to never run into one another. It’s like watching the greatest aerial dogfight in history, every evening. It is fun to pick out one bird, and watch it dodge and dive, turn, and come back through the fray again without ever making contact with either dragonfly or bird. I never tire of watching. Between the evening crew, and the bats after dark, I rarely see a mosquito on my property. Back to the point at hand, the error bars are vastly underestimated in the graphic. It is a travesty that Christopher Scotese’s data remains the standard, but the reality is that progress has been halted on any research that does not fit the meme. 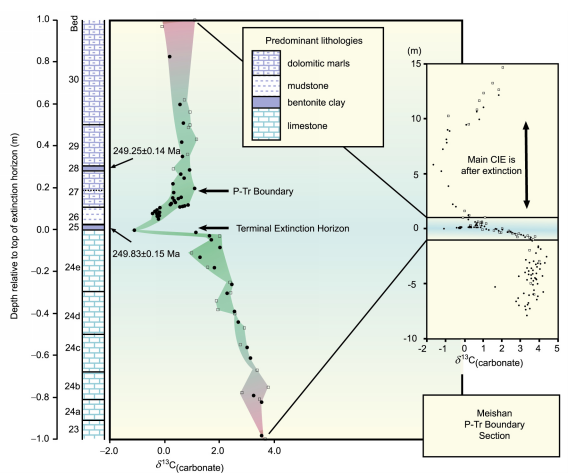 Given the consistent response of CO2 to temperature during and subsequent to the Permo-Triassic extinction, it seems very likely that there was a downward CO2 spike during the Ordovician extinction that simply does not resolve. The biosphere is Carbon limited. Life will consume every lighter 12C atom it can get its hands on. When everything dies 12C is released back. Ferdinand Englebeen correctly points out that ocean outgassing cannot account for the obvious CO2 response to temperature. Life can. So this should be considered a crime against life on Earth. Wow. Whatever caused the extinction, which, was definitely NOT Carbon dioxide, might be construed a crime against nature, or at least a crying shame. Methinks we are ships passing in the dark as I have already managed to do earlier in the thread.